Light and delicious, this Christmas cake is perfect for the holidays. 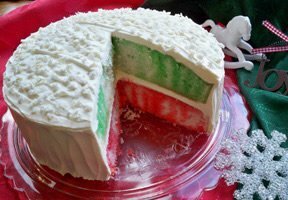 A white cake with red and green colored layers that will catch everyone's eye. It is sure to be the first of the Christmas goodies to disappear. Step-by-step instructions and great tips for making perfect fudge for the holidays. The kids will love helping you create their own special Gingerbread House. But they will have even more fun eating it when it is done.